Ito: Honda aims to cut energy use this summer and auto emissions over a longer term. TOKYO -- Honda Motor Co. has broken out the Hawaiian shirts as it prepares for another "cool biz" summer of energy conservation and dialed-down air conditioning across Japan. The move cleverly ties the automaker's conservation efforts to Japan's national zeitgeist. 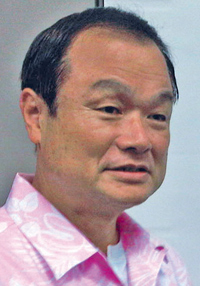 President Takanobu Ito and other executives donned the pink-and-white floral wear to underscore their company's commitment to environment-friendly technologies and a new goal of slashing its auto fleet's average emissions 30 percent by 2020. Honda is aiming to reduce power consumption, waste and emissions across the board in its automobiles, motorcycles and power products, as well as at its factories and offices. Keeping a tab on thermostats during Japan's sweltering summer months has become a common way of controlling electricity bills at Honda and other companies. Japan's electricity supplies are particularly strained because of the shutdown of nuclear power plants following the March 2011 disaster at the Fukushima Daiichi plant. The trend has given rise to the short-sleeve, no-necktie summer fashion known here as "cool biz." For its automotive products alone, Honda wants to cut its fleet's average carbon output, measured in grams per kilometer, 30 percent by 2020 from 2000 levels. Getting there won't be easy. Indeed, Honda's planned reduction in emissions slowed last year, as the company made fewer fuel-efficient small cars. Flooding in Thailand and the March earthquake in Japan hammered output at factories specializing in smaller vehicles. Honda didn't give actual fleet emissions totals. But the company said that in 2010 its automobile emissions were 12 percent lower than in 2000. Last year, emissions were just 10 percent lower than in 2000. Honda wouldn't be able to achieve the target without its new lineup of fuel-efficient Earth Dreams drivetrain technologies. Introduced last November, the suite of technologies includes new fuel-injected engines, overhauled transmissions and new hybrid systems. "If we didn't have Earth Dreams or hybrids, we couldn't achieve that," said Michio Shinohara, general manager for environment and safety planning. With the previous generation of drivetrains, still in the vast majority of Honda vehicles, Shinohara reckons Honda could achieve only a 20 percent reduction in emissions by 2020.